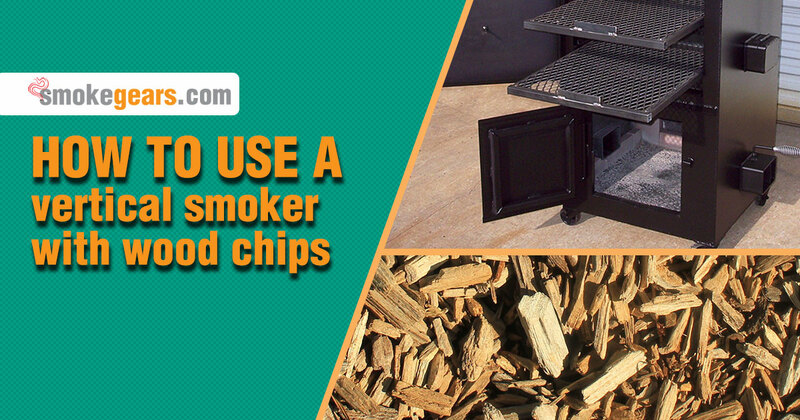 How to Use a Vertical Smoker With Wood Chips? If you are new to grilling, learning how to use a vertical smoker with wood Chips is one of the many tasks you are going to want to learn. Although it isn't difficult, many beginners have general questions about grilling times and temperatures. So let's take a look at how to use the smoker, alongside the best smoker thermometer, to make your life a little easier. In your vertical smoker, the electric elements lie at the base. They are usually atop a lava rock for heating purposes. The smoker chamber will sit on the base of your smoker. Due to the heat distribution, the best wireless meat thermometer will help you maintain proper internal temperatures when grilling. Another reason to have a thermometer is if you own a cheaper/lower end vertical smoker. They typically do not contain a thermometer on the lid. Temperatures typically run up to 250 to 275 F on the smoker. Fill the water pan up 2/3 of the way with lukewarm water. (The warmer the water the quicker it will reach the desired grill point. When plugging in your grill, using a 12 V outlet will be the ideal fit for longer grill times. It is important to monitor the temperature gauge as well. This is where your thermometer will come in handy. Due to the fact that different meats require different grill times and temperatures, it is important to ensure you have a good thermometer in place. You should also try to maintain temperatures anywhere from 220 F to 250 F, to avoid overly cooked meat. Of course you are grilling with wood chips. On the vertical smoker you want to make sure you have a sufficient amount of chips in place for grilling purposes. A good way to grill is by wrapping the chips in aluminum foil. Doing this will allow them to evenly heat, and retain higher temperatures on your grill base. Depending on the flavor profile desired, you can also choose from different chip flavors. From hickory to sweet, or something smokey, you have many options. You should place many aluminum packets between the base and racks where you are heating the chips. By laying the chips directly on the heating element this can cause heat spots (which you should avoid). So make sure to give a little space between the chips and heating base. Once in the aluminum packets, place the chips in a horizontal row across the heat rack. This will allow for even disbursement of the grilling flavor throughout. This also ensures all meats which are being smoked, will have the desired flavor profile when smoking with chips. Depending on the layout of your grill, there are different ways in which you can set up the chip packets, so do a little studying before placing them on the grill. Of course every cut and type of meat requires different grill times. But, in general, you are looking at about 2 to 3 hours for each set of packets you place on the grill with wood chips. This is going to allow the meat to reach the right internal temperature. It is also going to allow the flavor profile to work with the meats you are grilling as well. This is a base guideline. You might choose to go with lower temperature and smoke for longer. Again, play with the temperature settings and see what works best for you. It is really a matter of personal preference. As long as the meat reaches the right internal temperature, you can grill as long or as short a time period as desired. When grilling directly on the grates, you want to prevent the meat from sticking onto them. So wiping a little oil on the food grates is good practice. This along with the water you are going to add every 45 minutes to 1 hour, will help with moisture retention as well. So the meat is not going to stick, it is not going to overcook, and it is going to retain moisture throughout. Foods also tend to cook a little quicker on the lower racks. Of course because they are closer to the heating element. For this reason, adding a coat of oil to the rack is a simple way to avoid over grilling. Regardless of what you are grilling, the right temperature and prep work is going to result in the best taste and flavor profile. A good meat thermometer is going to play an integral role in the grilling. So invest in the best meat thermometer for smoker you can buy, if you want to ensure the proper temperatures. Your grill has a thermometer but this is an indication, and is going to be several degrees off the actual reading. Using a thermometer allows you to go directly to the thickest portion of what you are grilling. This is the best way to know exactly what temperature the meat is at, and what you can expect in terms of the preparedness before removing it from the grill. There is virtually no guesswork when it comes to grilling with wood chips on a vertical smoker. Of course each one has its own settings, so you should familiarize yourself with it prior to use. You should also know the design and features when using the grill. This is going to make your life a little easier. Regardless of how long you've been grilling, the right grill can make a world of difference in the flavor profile of what you are grilling. So, if you want to learn how to use a vertical smoker with wood Chips, these are a few of the basics you should understand before you fire it up.